Tarzan and Mowgli never impressed me much but I’ve always liked the concept of a “jungle girl”. What’s not to like about a buxom blonde swinging through the jungle wrestling apes? I’d say the only thing better is a buxom blonde swinging through the jungle wrestling dinosaurs. What can I say, I’m a fan of both hot girls in loin cloths and prehistoric worlds so when you put them together you can’t lose. My first exposure to such a thing was most likely the movie One Million Years BC starring Raquel Welch. Nova from the original Planet of the Apes was another loin-cloth laden maiden that I was exposed to when I was young. Not only does this genre appeal to me on the big screen but also in comic book form. That is why I’ve always been a fan of Shanna the She-Devil, a Marvel character whose been around since the early 70s. 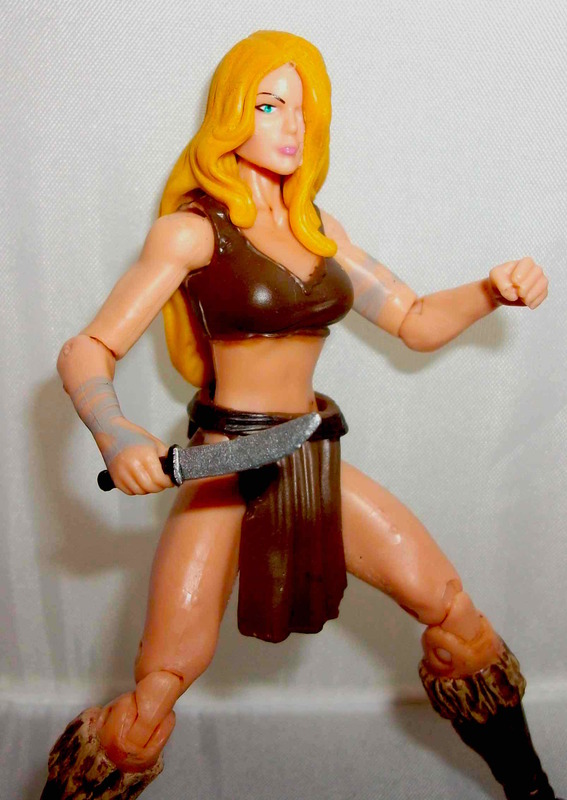 Before my time she started out as a solo act but by the time I started reading comics in the 80s she was married to Marvel’s lord of the jungle, Ka-Zar. After that she tended to play second fiddle to her slightly more popular husband. The two of them, along with their trusty sabre-tooth tiger sidekick Zabu, ruled over the Savage Land; a prehistoric jungle hidden in Antartica. Shanna’s 1972 solo book only lasted 5 issues and after that she was relegated to occasional guest star status. Shanna hadn’t been featured prominently in any Marvel books for decades when a strange thing happened in the mid-2000s; there was a sudden surge of jungle girl books seemingly out of nowhere. Shanna got her own 7-issue mini-series at Marvel in 2005, and then Sheena (a classic jungle girl from the 1940s) got her own mini-series from Devil’s Due Publishing and then a brand new jungle girl, imaginatively named “Jungle Girl”, appeared shortly afterwards in a mini-series published by Dynamite. It was a good time to be a jungle girl fan but it could’ve been a great time if more effort had went into the books. The Shanna book was written and drawn by Frank Cho. If you’re not familiar with Mr. Cho do yourself a favour and look up some of his artwork. I happen to own one of his art books titled “Apes and Babes” which is always a joy to flip through. He’s been working pretty steadily in mainstream comics since 2005 but he first came to my attention a few years earlier when he was writing and drawing the daily newspaper strip, Liberty Meadows. If you don’t recall the strip, it featured a gorgeously-rendered brunette caring for a bunch of wacky cartoon animals. It was far from my favorite strip but I appreciated his drawing skills which were leaps and bounds beyond those of most other newspaper cartoonists. I was excited about the Shanna book when it was announced. Not only for Cho’s artwork but also because it was a chance for a C-list character to really shine. I was quite surprised to discover after reading the first issue that the series was not about Shanna the She-Devil, the wife of Ka-Zar, but some other blonde in a fur bikini who was bio-engineered in a Nazi lab in the Savage Land. A group of men who crash land there discover her and name her Shanna. This was a puzzling choice. Why not create a new character or use the existing one? It was a little confusing trying to figure out how this story fit into the Marvel Universe at large. Was there two Shannas now or was the story not even set in the standard Marvel Universe? Despite the confusion I still enjoyed the series. The artwork was beautiful but the story was generic and dialogue was sparse (so as not to clutter up the many splash pages of Shanna posed provocatively) which made it difficult to get attached to any of the characters. A second Shanna mini-series followed in 2007 without Cho attached. Instead, Cho opted to go create “Jungle Girl” (who was pretty much the exact same character as his rebooted Shanna) and publish through Dynamite. I assume he did this for creative control reasons. The second Shanna series was equally underwhelming stroy-wise and without Cho the artwork failed to impress either. 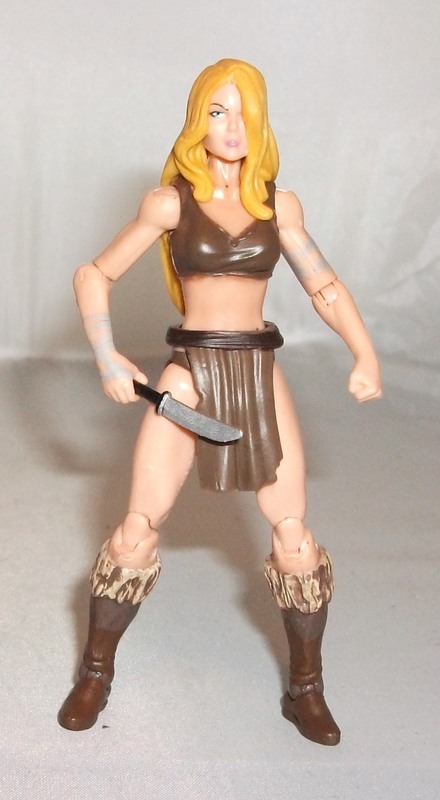 in 2013 Cho returned to draw Shanna in a Wolverine storyline set in the Savage Land but it oddly featured the original Shanna (Ka-Zar’s wife) not the new girl Cho created in ’05. It seems the present Shanna the She-Devil is an amalgamation of the two characters. This Shanna figure was included in the most recent wave of 3 ¾” Marvel Infinite figures. I picked her up at Walmart about a week ago. My patience is wearing thin with this line because I don’t feel the quality matches the price. I also bought the Vulture figure from the same wave and it’s a piece of junk. Thankfully this Shanna figure did not disappoint me. 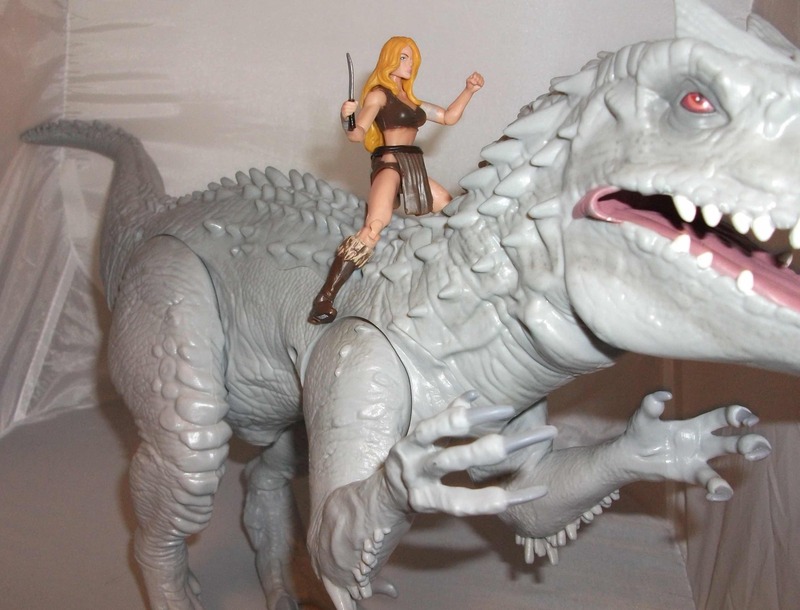 I actually think this is a pretty great action figure. The sculpting is really nice and the paint job too. Her eye and lip paints apps are perfect so it makes me wonder why so many modern G.I. Joes produced by Hasbro are so sloppy. The figure is well articulated but doesn’t have any torso joints. I’m okay with that because multiple joints can often detract visually from a figure with so much skin showing. The previously released Marvel Legend Shanna is a prime example of that. The only accessory she comes with is a large dagger which can be sheathed on her belt. I’m happy to get any accessory considering so few of these Marvel figures come with add-ons but it would’ve been nice to get a spear and maybe even a little dinosaur too. If nothing else she should come with a display base. The fact that Hasbro has stopped including display bases really pisses me off. I wouldn’t care if they did away with the personalized bases to save on costs but a generic black base should come standard. In closing, this is a great little figure and I can’t imagine how Hasbro could have done any better at this scale. Hopefully we get an equally good Ka-Zar in the near future. 10 out of 10. Posted on October 11, 2015, in Marvel and tagged Action Figure, Marvel, Review, Toy. Bookmark the permalink. Leave a comment.